Up to this vacation, we mostly did short drives. Two hours here, three hours there – stretching to three and a half hours with traffic. Never had either of us been to Myrtle Beach, or South Carolina. My wife though, lived in Atlanta, Georgia for a short while – so she knew the south. I, on the other hand, had always been a Northeast boy. This was a hard departure from previous trips – a ten and a half hour drive. We took off later than we expected, which only compounded time issues. As planned, we were to take off at 6am – only to take off at 8am. Now, this wouldn’t have been too bad…but we had to make a pitstop in Manhattan. We made our way down – Starbucks in hand. After approximately two and a half hours of driving on I-95 south, we reached our first pitstop: Maryland House Rest Stop in Aberdeen, Maryland. We picked up some food, and a toy for the munchkin, used the rest rooms – and off we were again. The Maryland House Rest Stop surprised us – we weren’t used to rest stops of that size – it was huge. 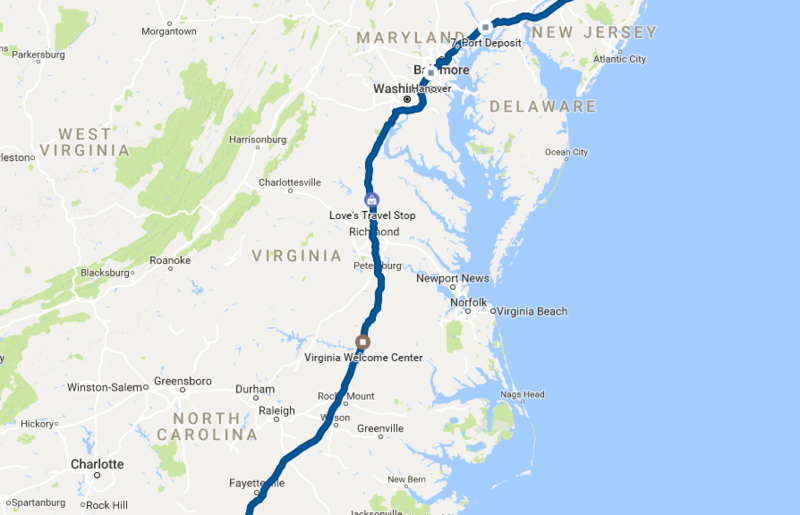 This time we were headed to another rest stop – the Virginia Welcome Center in Fredericksburg, Virginia. This was also another two and a half hours away from the Maryland House. For this one, it was purely a bathroom break.